Leatherjackets derive their name from their skin, which should be removed before serving. This can be done after cooking, for easier and cleaner removal. Under their tough skin these fishes have a white flesh with a pleasing light flavour. The flavour is best when the leatherjacket is fresh. 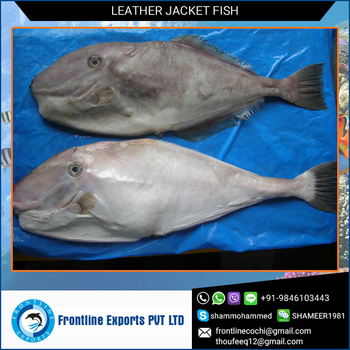 Because of their firm texture, leatherjackets are very good for Thai-style curry or a stir-fry. They are also excellent for fish balls as the flesh holds together very well. Smoking leatherjacket is an excellent method of preparation—try the “tea-smoked leatherjacket with avocado and frisée lettuce salad” suggested by Peter Harris of the Grange Jetty Kiosk in South Australia. When baking or grilling it is advisable to prepare leatherjacket whole. Remember to incorporate lashings of lemon and cracked black pepper for better flavour and texture. The Waste water generated during processing is treated using up flow anaerobic reactors followed by activated sludge system. During this process organic matter present in the waste water is oxidised to harmless carbon dioxide and water.